Being a compassionate, empathic person who is committed to self discovery, growth and transformation in 2018 was hard. And that’s not based solely on my own personal experience (although it could be), but the dozens of women I coached and read tarot for this year. In a world where we are often told that we need to wait for permission, that someone else has the answers; a world where we are often ignored or patronized or silenced - it can feel nearly impossible to trust our own instincts and vision. Success and growth is rarely linear, but it doesn’t have to be complicated. It’s amazing what reflection and dedication to self examination can do. Rather than forcing our will upon others, hustling when we feel exhausted, giving too much of our time, energy, or ideas to sources that may not deserve them, I’ve watched the most beautiful expansions arise from our willingness to be intentional with our personal resources. To do that, I believe we must honor the cyclical flow of our energy, our creativity, the seasons and our bodies and allow that to inform our words, our actions, and our plans. As we enter 2019, I was inspired to create something to support you for the full year. Something that will make it a little easier to understand and live within your own cyclical nature. I want to help you hold space for and deepen your relationship with yourself. 12 months of support to help you reconnect to your personal power through intuition & reflection. The program is not about me giving you all the answers, it’s about giving you the space to discover them for yourself. Each season, you will receive a 30 min remote reading. These will come with photos & brief written descriptions along with a recording of the reading in full. Each season will tie back to your annual reading so you’re able to reflect on the path from energy to embodied action. Beyond our personal journeys, we are affected by collective energy. This content is meant to support you in understanding what is happening universally and invite you to connect with it. 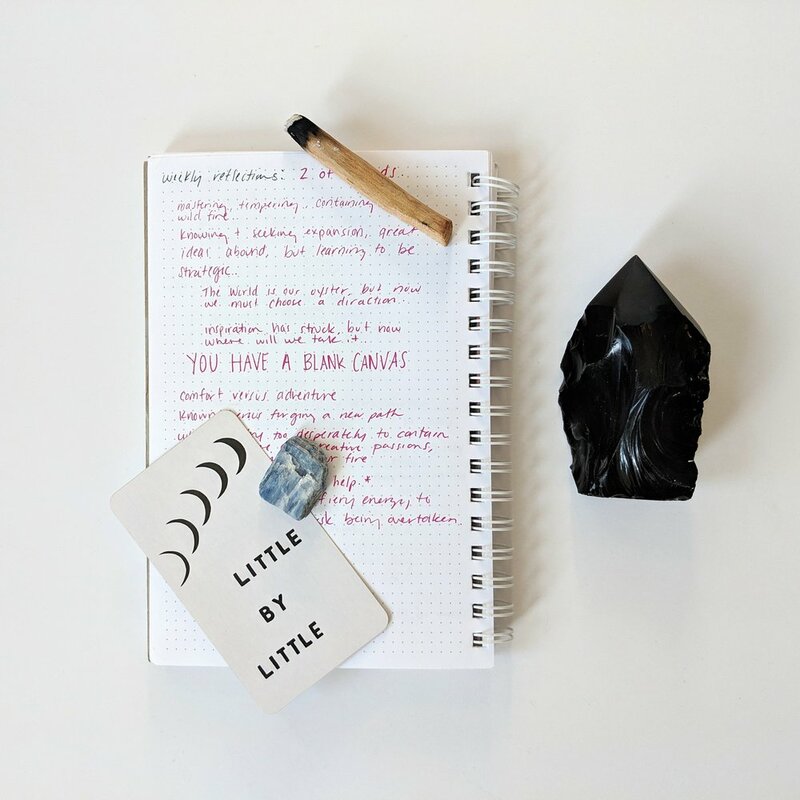 These could include (but is not limited to): Journal Prompts, Self Care Rituals, Tarot Lessons, Essays. I look forward to creating something very special with those of you who are ready to commit to personal development, reflection and growth this coming year.